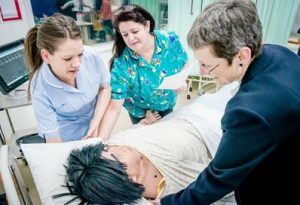 We have won a contract for over £4 million to provide higher apprenticeships for the new role of Nursing Associate, bridging the gap between nursing assistants and Registered Nurses. Vice-Chancellor Professor Debra Humphris (right) lends a hand to apprentices Lorna Pointer and Nicky Morgan, both studying the Health and Social Care Practice foundation degree. We welcomed the first new apprenticeships to the school this week and they will spend around 40 per cent of their working time attending taught sessions or on placement with us. Tagged Apprenticeships, Health and Social Care, Nursing, nursing associate, Skills for Health apprenticeship framework. Bookmark the permalink.